← Obama, Third Parties and Bears, Oh My! Now that the election dust is settled — and while the policy dust is being kicked up — what can a closer analysis of the November results tell us about who wants what in Maine? I’m going to use the election results, plus existing contextual data, to talk about the two big questions: 1) what drove voter turnout? and 2) who were Gov. LePage’s new supporters? Both of these questions remain highly relevant for legislators considering the governor’s policy plans. A third question concerns the political impact of changes to municipal revenue sharing. The governor has been an avowed foe of municipal revenue sharing since arriving in office and, just as he did in 2012, he is currently advocating for the elimination of the program. As I’ve spent a fair amount of time thinking about municipal revenue sharing, I was curious to discover if the towns that faced the hardest consequences of that change – either in terms of reduction of direct revenue from the state or in terms of property tax increases – responded by voting against the governor. By combining data from a variety of sources, we can see relationships between the political, economic, and demographic features of Maine municipalities. The first thing to observe is the clear power of incumbency. Support for Gov. LePage improved across the board, with only 15 of the 457 municipalities I studied giving him a lower level of electoral support. Votes in 2010 strongly predicted votes in 2014. Beyond this, however, there is some evidence that the prediction that municipalities with a larger proportion of older residents are not more supportive of Gov. LePage. 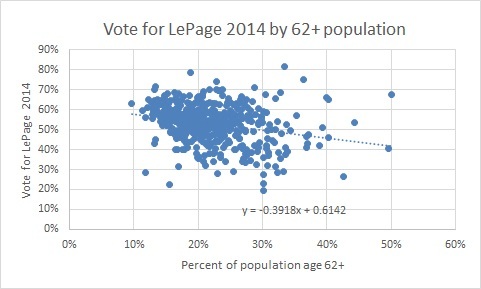 In the 2014 elections, there was a weak negative relationship between votes for LePage and percentage of municipal residents over age 62. This relationship is difficult to see because of the highly visible and significant political counterexamples of Portland and Orono, both with very low median ages (36 and 21!) relative to the rest of the state. However, characterizing older Mainers as being uniformly conservative looks to be fairly inaccurate; meanwhile, younger sections of western and southern Maine are far from uniformly liberal. Wealth was another interesting variable to examine. Towns with a higher percentage of older residents also tend to have lower median household incomes, suggesting higher incomes and support for LePage might travel together. At the same time, Maine’s higher income areas tend to be in areas with higher levels of support for Democratic candidates. Comparing the 2010 vote with the 2014 vote provides insight here. While, on average, the higher a community’s average median household income the lower its level of support for LePage in 2014, this was much less true than it was in 2010. Either because of the collapse of the Cutler candidacy–or because they had come to like him as a candidate–a number of residents of higher-income municipalities switched to supporting LePage in 2014. Wealthy towns moved further towards LePage in 2014. At the same time that we see the emergence of a break between older and poorer and younger and wealthier Maine, the interesting and contradictory element suggested by the election results is that while older voters were not more likely to support LePage, they certainly were more likely to turn out for the election. For every additional year in median age of municipal residents, turnout increased .6%. This was literally visible in the numbers for our youngest and oldest municipalities: moving from the municipality with the youngest median age (Orono) to the oldest (Ogunquit), we see an increase in turnout from 38% to 68% of the towns’ registered voters. The higher voting levels among older voters is consistent with the “traditional voter” hypothesis, which states that older voters vote as a matter of routine and therefore are most likely to turn out for the more local, non-presidential elections. In case you were interested in looking at more potential relationships I am including the dataset I used to explore these relationships. If anything interesting stands out to you in the numbers below, please share it in the comments! UPDATE: I cannot believe I forgot to look at the bears. With municipal level data it is much more possible to identify the effect of interest in Question 1, the bear-baiting measure, than it was with the county-level data. So what was the effect of the highly contentious ballot measure on turnout and support for LePage? Was it a game-changer? It totally was. If 2010 vote for Gov. 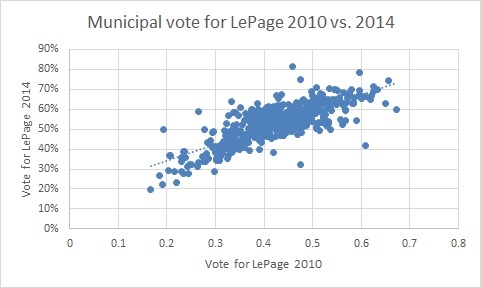 LePage predicts nearly two-thirds of the 2014 vote, and increased warmth towards LePage in wealthier towns added a bit more, adding in votes to support bear-baiting adds still ADDITIONAL predictive strength. Controlling for people in the town who voted for LePage in 2010 and the power of median municipal household income, every four votes against Question 1 predicted an increase of 1 vote in support of Gov. LePage.